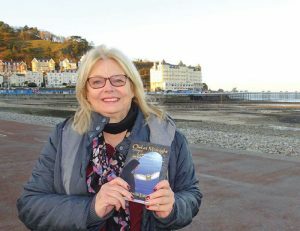 Patricia Lennan on the beach at Llandudno. Patricia Lennan’s mother came from North Wales, and it was there, to the Isle of Anglesey (Ynys Môn), that Patricia moved thirty six years ago. She was drawn to the myths of Wales and to Welsh history, especially to the lives of the women who are largely forgotten by many historians. One of these women was the last royal daughter of Wales, Gwenllian ferch Llywelyn, who was captured as a baby by Edward I and placed in a priory in Lincolnshire, while King Edward built his formidable ‘Iron Ring‘ of castles to maintain his conquest of Wales. It remained doubly in the interest of successive English kings to keep Gwenllian hidden away: not only was she the daughter of the Prince of Gwynned, but her mother was Eleanor de Montfort, granddaughter of King John of England. started with a family secret. ‘My mother received a letter informing her of the death of a brother, a half-brother as it turned out, who lived in Abergwyngregyn, North Wales. My parents were living in England at the time, but my mother’s family was originally from Abergwyngregyn and Llanfairfechan. We were intrigued; no one on my mother’s side of the family knew about him. Only my Nain (Welsh grandmother) it seemed would have been able to tell us the full story, but she had died in 1954. Pen y Bryn, previously known as Garth Celyn. It would take too long to tell the story here of how we discovered fragments of his life and pieced together his history, so to be brief I will just explain that Uncle Thomas Owen was living at Pen y Bryn House, Abergwyngregyn, previously known as Garth Celyn, when he passed away. This site has been identified for some time now as an original court (Llys) of the Welsh Princes. 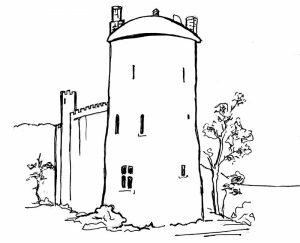 When visiting the property later on, I was shown the room where it is thought Eleanor de Montfort gave birth to the last native Welsh princess, Gwenllian, and the tunnel which led to the sea, and other tunnels which once led to the mountains above. It was here where my story too was born. 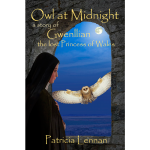 I set out to discover more about the life of Princess Gwenllian. 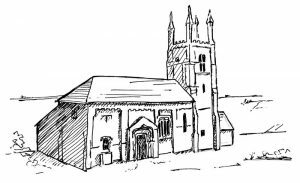 The few written historical documents that exist record that she was placed as a baby in Sempringham Priory, Lincolnshire, and spent her whole life there until she died at the age of 54. 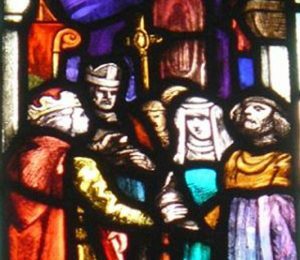 A leaded window at Worcester Cathedral depicts the marriage of Llywelyn ap Gruffydd and Eleanor de Montfort, 1278. I have developed my story on a framework of historical fact, especially regarding the events surrounding Gwenllian’s father, Prince Llywelyn ap Gruffydd, and his family, and I have tried to authentically depict life in a Gilbertine convent in the late thirteenth century to illustrate how Gwenllian’s life might have been. To buy the book click on the image.